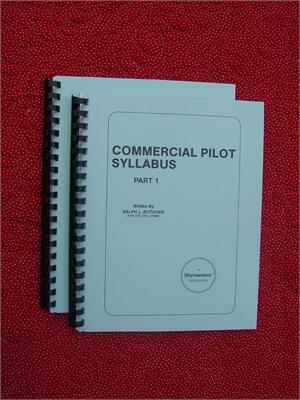 A flight instructor uses this syllabus (143 pages) to prepare a private pilot in CCA* or TAA* (Glass Cockpit and GPS navigation) for a commercial pilot certificate under 14 CFR part 61. A commercial pilot, training to be a basic CFI, uses this syllabus (lesson plans) for their CFI practical test. Part one of this syllabus, the student's reference manual, contains a chapter on commercial maneuvers that supplements Skyroamers® Private Pilot Flight Training Manual. * CCA - conventional cockpit aircraft, TAA—technically advanced aircraft.